5 surprises for 2018. Watch out for Chinese LNG demand, blockchain, global hub price penetration, battery & engine headwinds and a fund transaction spree. Welcome back to our first feature article of the year. We kick-off the year with a set of 5 potential surprises to watch for on the radar screen in 2018. Usual caveat – these are surprises to take into consideration, not predictions to anticipate. 1. A setback for LNG prices? Commodity price strength may continue to surprise in 2018. In particular, oil looks to have broken out of its 40 – 60 $/bbl trading range of the last two years. Commodity demand is being driven by China but also supported by healthy economic & manufacturing growth across most global economies. Asian spot LNG prices have doubled across the last 6 months, rising above 11 $/mmbtu. Behind this was a surge in Chinese LNG demand to 37 mtpa in 2017, up 40% year on year. A number of factors have aligned to support Chinese demand including a strong policy shift to gas, rising coal prices, colder Q4 weather, strong economic growth and lower H1 spot LNG prices. So it seems reasonable to assume LNG prices will continue to strengthen in 2018… doesn’t it? We’re not so sure. There is a risk that momentum behind the drivers of Chinese demand growth weakens in 2018. This is particularly the case if China’s 2017 policy shift to gas captured much of the ‘low hanging fruit’ from residential heating & industrial production. As new supply continues to ramp up from Australian and US producers, a slower pace of Chinese demand growth could erode the LNG market tightening trend of H2 2017. That may support the re-convergence of Asian and European spot prices. We wish you good luck if you want to convert your savings into bitcoin in 2018. But the blockchain technology behind bitcoin could radically change energy markets. 2018 may be the year the blockchain moves from the fringe to the centre of energy industry debate. Blockchain is a technology that supports ‘peer to peer’ transactions. It is supported by the distributed storage of data across multiple users. As such, blockchain fundamentally challenges the conventional approach of centralised data storage e.g. via an exchange, a payment system or a grid operator. It also facilitates real-time multilateral trading at very low cost. Transaction costs: Blockchain efficiency has the potential to crush energy transaction costs. With an eye on this, BP & Shell are leading a push to set up a blockchain based energy trading platform by the end of 2018. Security: Cyberterrorism is rapidly becoming a key threat to energy systems, whether physical (e.g. grids) or financial (e.g. exchanges). Blockchain is effectively un-hackable and removes the risk of attack on a central data repository. Connectivity: Blockchain supports a much broader range of decentralised energy transactions, e.g. facilitating the purchase & sale of electricity from distributed solar & wind and EV charging. Disintermediation: The flexibility and transparency of blockchain encourages direct peer-to-peer dealings. Blockchain’s responsiveness and efficiency in doing this breaks down barriers for fully optimising smart grids, demand side response & distributed generation. There has been enormous momentum behind investment in UK distribution connected reciprocating engines and batteries in 2016-17. This been supported by a rapidly evolving requirement for flexible capacity as well as falling costs of capital and technology. While battery cost reductions continue at pace, they are last year’s story. The focus for battery developers in 2018 may shift from costs to revenues, as short duration lithium-ion batteries start to become a victim of their own success. Frequency response revenues present the biggest risk for battery economics. More than 500MW of batteries already have capacity agreements. At least as much again are likely to receive agreements in this year’s auction. 2018 may be the year when UK frequency response prices start to buckle under the weight of new battery supply. Battery capacity market revenue was also dealt a blow in Dec 17 with more penal derating factors. Competitive pressure may also rise for UK gas engine developers in 2018. Business model focus has shifted to wholesale market and balancing mechanism (BM) revenues, given the rapid decline in triad revenue by 2020. But 4-5 GW of new peaking capacity over the next 3 years raises the risk of a surprise erosion in prompt energy & BM margin. Legacy long term gas contract positions will ensure that oil-indexation remains in Europe and Asia for many years to come. But the relevance of oil-indexation is being rapidly overrun by the penetration of hub prices. 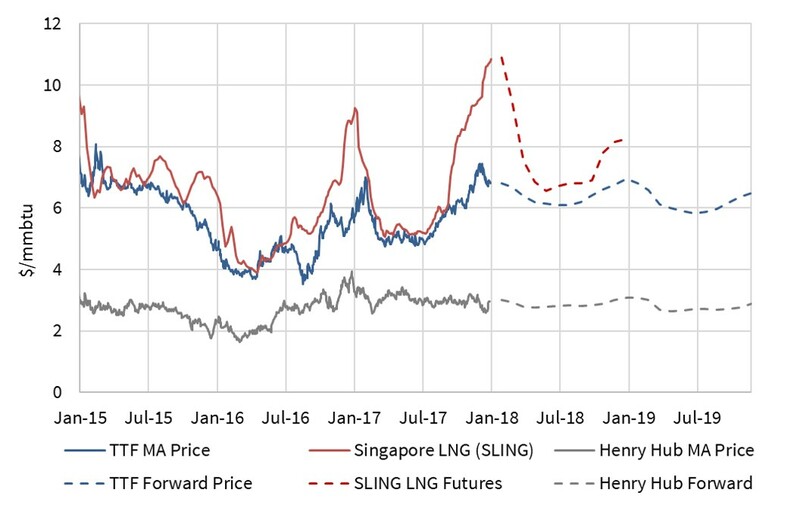 This is creating greater spot price signal connectivity across the world’s regional gas markets as illustrated in Chart 1. Gazprom’s change in strategic tack in response to the 2017 EU antitrust case is the last key hurdle on the way to hub dominance in the European gas market. Gazprom is allowing ‘TTF corridor’ price concessions on oil-indexed contracts as well as more actively managing the delivery of its gas at hubs. This transformation has helped Gazprom to grow its European exports, from levels averaging around 150 bcma across the first half of this decade, to almost 185 bcma in 2017. Gazprom’s willingness to recognise hub prices may surprise again in 2018. Hub price signals are also transforming the LNG market as it transitions towards shorter term contracting and spot price optimisation. This is reinforced by a ramp up in flexible US export volumes that are being optimised against spot price signals. These factors may support a step change in hub price penetration and trading liquidity in the LNG market in 2018. In a record low interest rate environment, infrastructure assets have become a key target for both dedicated infrastructure and private equity funds. The average infrastructure fund size has roughly tripled over the last 5 years, with 2017 seeing record capital raising for infrastructure. 2018 may be the year that fund acquisition of European energy assets causes some big surprises. Big US and Asian funds are converging on European energy markets to compete for assets with the local players. Decentralisation, decarbonisation and digitisation are strong catalysts for restructuring of utilities, assets sales and aggregation of smaller players. Private equity capital is particularly targeting the more complex risk profiles of thermal power and unregulated midstream gas assets. Transaction momentum may be helped by the restructuring or breakup of incumbent utilities. Fortum’s bid for Uniper may act as a catalyst for a broader restructuring of the large German utilities. This could have a knock-on effect in the UK, reinforced e.g. by Centrica’s current woes and the recent Innogy/SSE retail merger. Again, it is unlikely to be a dull year. We wish you all the best in navigating the surprises of 2018.